whenever we walk through the mall, i always smell the aroma of warm pretzels wafting from the auntie anne's pretzel store. i haven't bought a pretzel from auntie anne's in years, but they always smell so good. 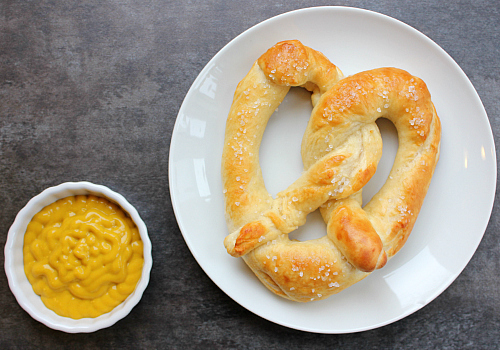 so, i was intrigued when i found a copycat recipe to make your own auntie anne's pretzels at home. 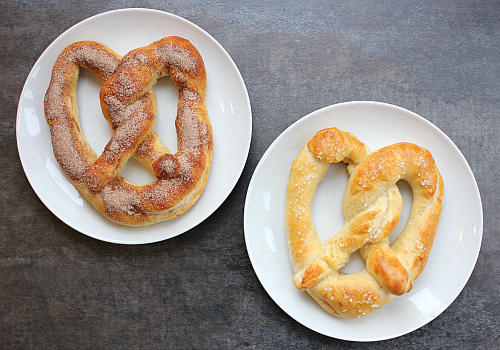 when we made these pretzels, we made them into different types of pretzels. 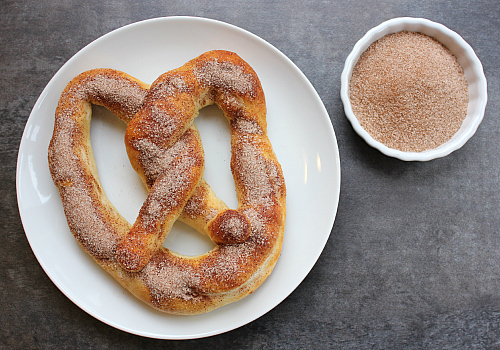 we cut some into small bite-sized pieces, and formed some into traditionally-shaped pretzels. 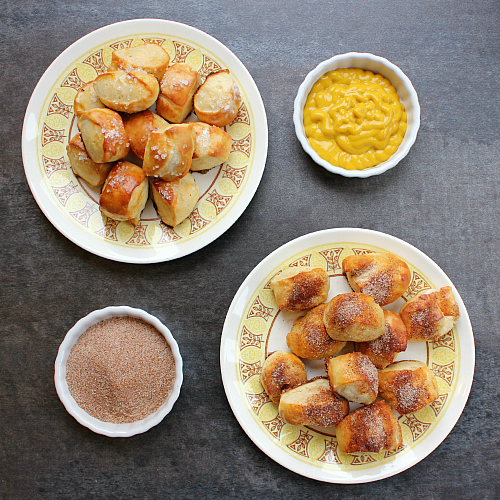 we salted half of the pretzels and dipped them in mustard and cheese, and we covered the other half in cinnamon sugar. 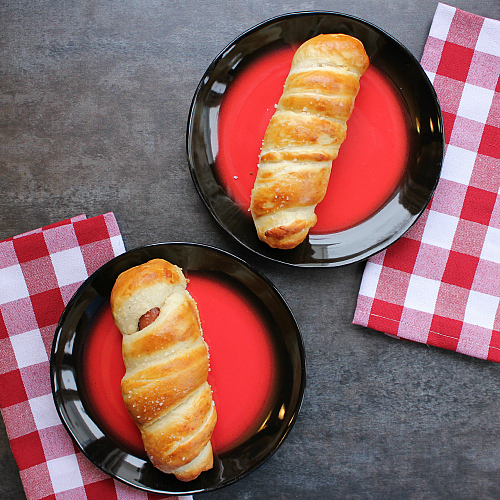 we even wrapped some of the pretzel dough around hot dogs to make pretzel dogs too! all of them were so good. 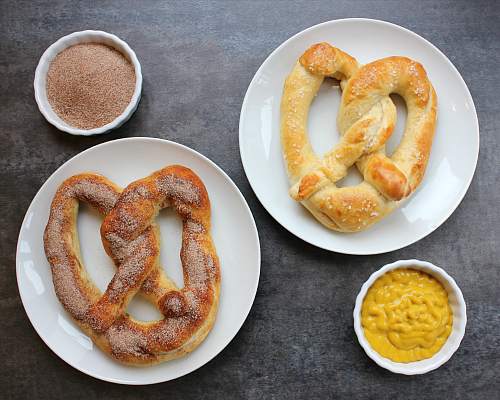 there's absolutely no reason to buy pretzels at the mall when you can make your own right at home! 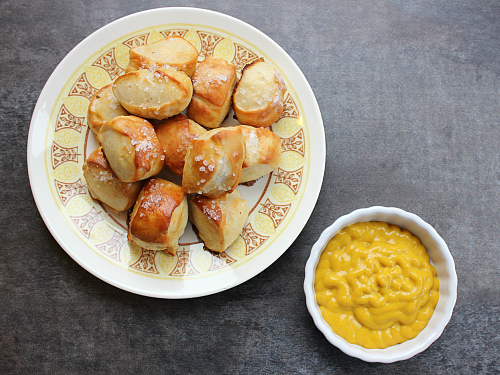 this recipe made a bunch of pretzels, which is fine if you are cooking for a crowd. since we are only two people, we put the extra pretzels in ziploc bags and froze them until we were ready to eat them. they reheated really well! bite-sized pretzels . . .
traditionally-shaped large pretzels . . .
pretzel dogs . . .
warm the milk until it is between 110-115 degrees F. stir the yeast into the warm milk and let it sit for 3 minutes. add the milk, yeast, melted butter, and sugar to the bowl of an electric mixer fitted with a dough hook. add the flour, one cup at a time, and mix until the flour is incorporated and forms into a dough. kneed for about 10 minutes. place the dough in a greased bowl, and cover with plastic wrap and a kitchen towel. allow the dough to rise for 1 hour in a warm place, until doubled in size. preheat your oven to 450 degrees F. combine the warm water and baking soda in a wide and shallow bowl. punch down the dough and divide it into 12 even portions. roll each portion of dough into a very thin and long rope, then either form the dough into a pretzel shape or cut it into small pretzel bites. dip the dough into the water and baking soda mixture, then place on a greased baking sheet. bake for 7-10 minutes, or until brown. 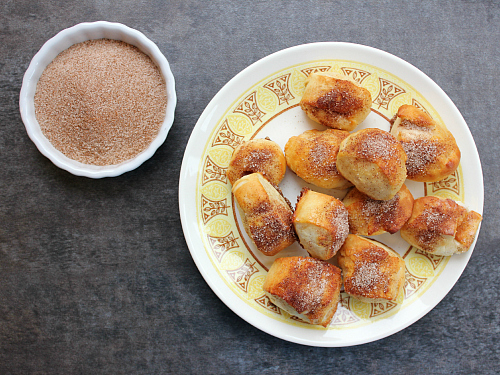 once baked, brush each pretzel with melted butter and sprinkle with either salt or cinnamon sugar. They look very good. That is a good idea to freeze them so they last longer.